Maintaining health and fitness is a major cause for concern for many in recent times. However, staying fit and healthy is at the expense of avoiding your favorite foods. In addition to controlling your diet, maintaining your fitness depends on exercise. In other words, we can deduce that exercise and diet go hand in hand. Nevertheless, time remains the most important issue even if we are able to control our cravings and commit to exercising. The lives of people, nowadays, have become so busy and hectic that they can barely spare time to go to a gym. adjustable weight stacking for a smooth and controlled body exercises and hence no need to load and unload weight plates. Up to 214 lbs. of weight resistance. Combines 3 different kinds of strength building machines in one compact design. Moreover, it allows you to perform over 100 club-quality exercises. Offers two settings: vertical butterfly and chest press. The Bowflex Home Gym is the ideal machine for shredding off those extra pounds. It is built on the principle of resistance. Bowflex is mostly used for building strength and muscle. Its basic advantage is that it targets all the muscles of the body thus, with Bowflex, you can work all the muscles of your body simultaneously. It helps to tone your overall body figure. Therefore, instead of apportioning your time on various machines to target specific areas of the body, you can opt for a single machine like Bowflex which can cater to all the muscles of the body at a go. Due to the aforementioned reasons, it can be regarded as an ideal item that can form part of your home gym. In addition, Bowflex reduces the need for other types of equipment, since Bowflex serves multiple purposes. Bowflex is an ideal item to include in your home gym. It is a one-size-fits-all machine. It can be rightly said that Bowflex is the best home gym for a full-body workout. Options for weight resistance from as little as 5 to around 210-pounds. Over 30 strength exercises can be done from this single machine. It consists of both lat pull-down and horizontal bench press. Provides flexibility to perform various strength exercises. It can be easily stored by folding the machine and does not require a lot of space for storage. A full-body workout is possible by targeting your abs, arms, chest, back, shoulders, and lower body. It is an effective device for both resistance and cardio training. The standout feature is the presence of resistance rods instead of weight plates that offer a more natural workout and gets the heart racing from rowing motions. The machine takes considerable time to assemble. It is not effective for working the leg muscles. It is more suited for casual style workouts and not for strenuous exercises. One size that fits all is a possibility with this gadget. It is a complete home gym and targets all areas of the body. It is easily movable with zero difficulties in utilization. The product comes in a large box with well-organized and labeled components. It also includes clear instructions for easy assembling. It is, without a doubt, one of the best home gyms for a full-body workout. This machine is a total body trainer. 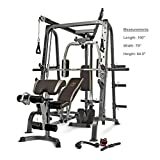 It is the unification of three different strength machines, which include a Smith Machine, linear bearings, a pulley system and an Olympic free weight rack. It has versatility and is an attractive product. Marcy Diamond Elite Smith System provides you with comprehensive exercise options. With this machine, you can perform both functional as well as club quality exercises. Additionally, it is a total leg developer and bicep preacher curl. Moreover, its pectoral fly station is effective in targeting your chest muscles. It has a total weight capacity of 600 lbs. It has remarkable construction features with 2-inch x 2 3/4 inch and 2-inch x 2-inch heavy-duty tubular steel. Furthermore, it has a durable powder coated finish. Its ultra-gliding bearings ensure smooth movement. It has an increased stability owing to its floor base design. In short, we can consider this machine, the best home gym for a full body workout. The design of the frame is floor-base. Entails a dual function for roller pads, leg developer as well as curl bars. It consists of a non-slip diamond plated foot brace for doing seated row exercises. It is equipped with both high and low pulley stations. The high pulley is well-suited for the shoulder, back, and triceps exercises, while the low pulley is fit for biceps. Separate working of press arm sections makes chest and chest press exercises easy for users. The machine is covered with high-quality foam. It has a comfortable usage. Vinyl coating covering the weight stacks ensures a soundless environment during usage. Smart Dimensions for convenient storage in a small space. It has weight limitation as it can only support up to 100 lbs; no extra weight can be added. Its assembly is an arduous task. If you are not inclined towards professional equipment, then this is a good choice of equipment for you. Furthermore, it is also a good choice amongst best home gyms for a full body workout in case you do not require massive resistance. It is good for people who want a toned and shaped upper body without going to a gym. The MWM-900 from Marcy is another blessing to the world of fitness. 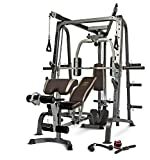 It is a pocket-friendly machine which provides medium fitness range. Additionally, it is an all-in-one fitness machine with a compact frame design. You can perform many calorie-burning exercises with this monster. Furthermore, the transition from one exercise to another is relatively easy as it requires no adjustment. Every muscle group can be targeted with the help of this machine. It is also effective in increasing muscle mass which makes it one of the best home gyms for a full-body workout. Coming over to its construction, Marcy MWM-900 consists of a 14-gauge steel tubing. Additionally, the coating on the parts of this machine is corrosion and scratch resistant. This makes the machine durable. Moreover, it does not need a large space to fit in. A room with a 7-inch ceiling is well-suited for its storage. It is perfect for those who would like to remain lean and in great shape with a minimal time investment. It is dual functioning and consists of a leg developer for leg extension and curl exercises. High and low pulleys are present for upper and lower body exercises. 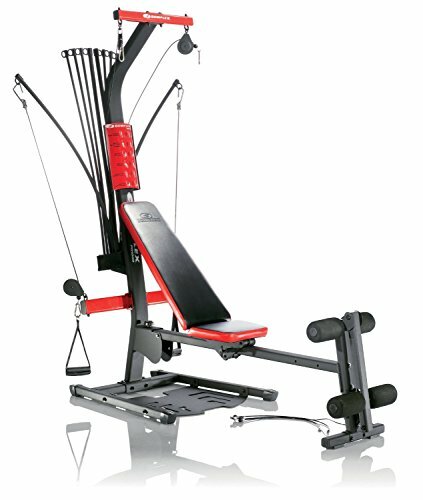 Performs chest press, arm and vertical butterfly, dual functioning supported by independent motion. It is provided with overhead lat station for abs, back, and triceps exercises. Maximum weight capacity is 300 lbs with a 150 lbs weight stack present. It is easy to assemble and comes with organized screws. The construction of the machine is sturdy with an elegant frame design. 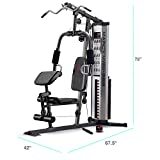 It consists of six workout stations including chest press, pec fly, low pulley, high pulley, curl pad, and leg attachment. It is fairly heavy and the weight adds to its stability so it doesn’t wobble or move when in use. It is very well suited for apartment use. Tools for its assembly are not included. The handles need to be readjusted when doing chest fly to avoid the sticking of handles into your chest. The weight stack is not up-gradable. Marcy MWM-990 is a home gym system designed for beginners and intermediates. It offers a full-body workout at a very reasonable price. It provides the possibility to perform more than 36 exercises targeting most muscles. The non-steel weight plates make the machine durable and cheaper than other best home gym options. It is a reasonably priced machine with a range of features. Without a doubt, it can also be categorized as one of the best home gyms for a full-body workout. Getting quality training comfortably in home is now possible with help of this machine. It is both compact and versatile. This machine is good for a modest body toning as well as building. It is an ideal machine for beginners. You can use it as a stand-alone unit in your home gym. Considering the overall construction, this machine has a heavy-duty 14-gauge steel tube. This makes this machine durable whilst very light. Moreover, it has a sleek design due to its durable powder coat finish. It embraces a dual-functioning press arm and a double pulley system. You can perform leg workouts easily with this machine as it aligns with knee joints. Furthermore, its bicep pad is fully adjustable. You can easily perform exercises like hammer curls and barbell with this machine. 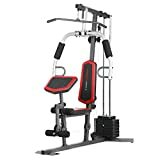 This machine is a great mid-range option and one of the best home gyms for a full body workout. It embrace a durable steel construction(14-gauge). It has a 150-pound vinyl-coated weight stack. It consists of high and low pulley stations, and a dual press arm. It’s dimensions are 68x 35 x 78”. It offers a decent at home workout in an inexpensive way. A safe recommendation for beginners. It is quite effective for upper and lower body exercises. Good for toning the muscles. It provides a variety of weight options. It has sturdy steel construction, which makes it quite durable. The frame is of thin 14-gauge steel that limits the user weight capacity. It is designed in a manner such that additional free weights cannot be added. For comfortably seated rows, no foot plate is available. The assembly of the machine is an arduous task. This stack gym from Marcy provides you quality training right from the comfort of your home. This makes a good candidate to be included in the category of best home gyms for a full body workout. 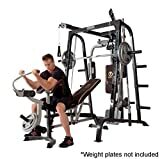 This machine is an ideal and affordable addition for an intermediate to an advanced weightlifter. High pulley: it comes with a lat bar, which is ideal for fine-tuning your lats as well as your back. It also offers a wide variety of positions for optimum results. Chest press: it provides freedom of motion range. It is safer, in a sense, as you do not have to worry about dropping the weights. Chest fly: It targets your major and minor pectoral muscles. It also works your shoulder and chest muscles. It both builds as well as defines the aforementioned muscles group. Leg developer: it aids in lower body muscle growth and development. Preacher curl: it isolates the targeted muscles by keeping your body stable. Low pulley station: helps to build and tone your biceps, deltoids, trapezes, triceps, forearms, and rhomboids, et cetera. This monster has all the essential things you require to jump-start your workout routine. 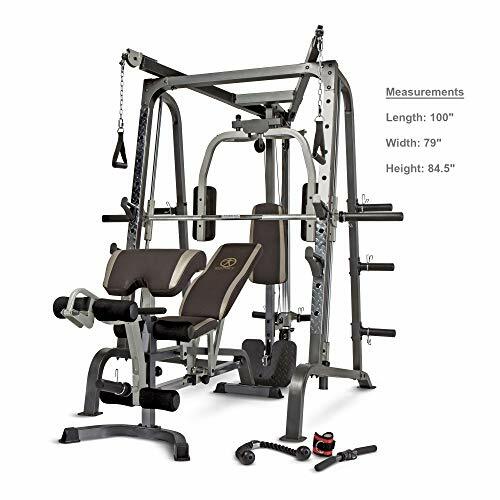 Weider Stack Gym by Mega Deal is an ideal machine for your home gym. Furthermore, it offers a resistance of up to 214 lbs, which depends on exercise type and weights. This product can last for many years due to its durable steel tubing. It is also a good choice to consider amongst best home gyms for a full body workout. It provides a weight resistance of up to 214 lbs. It is a single machine with 6 muscle-sculpting stations. Its 81 lbs Dura Stack weight stack offers an ideal combination of durability and fluid motion. Its durable steel tubing can make it last for a long period of time. The build quality of the device is great. The device consists of steel components and the bench area is made up of sturdy comfortable leather. The machine offers a total body workout. The resistance of the machine can be increased by using the resistance band that can add up to 50 lbs of weight. The design of the machine is well suited for small spaces. It is cost effective and versatile, offering a wide range of motions. The device comes without an exercise guide. Not recommended for users having a height of six feet or more. The gliding on the device is not as smooth as complained by some users. Weider 214 Stack is another candidate swiftly making its way onto the list of best home gyms for a full body workout. This is a compact machine which can be easily stored without any hassle. Despite being compact, it packs a powerful punch with 6 sculpting workstations. However, you cannot expect to become a bodybuilder with this machine. So, finally, the drum rolls as we announce the winner of this list of best home gyms for a full-body workout. There are many options to choose from when opting for a home gym. The above mentioned best home gyms are ideal for beginners. 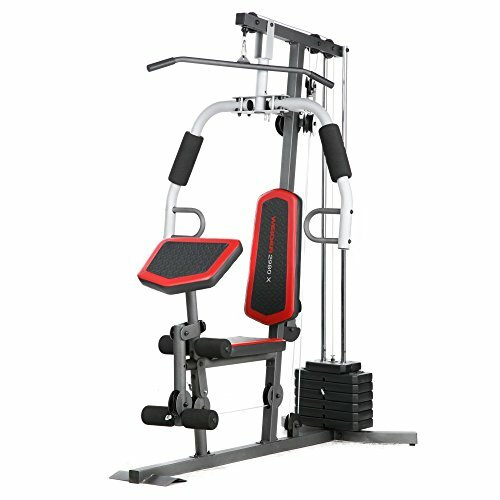 Bowflex PR1000 has an edge over the others in terms of its competitive price range and its features. Furthermore, Bowflex has an inbuilt cardio working station which is missing in Marcy Gyms. Bowflex is also easily foldable than the Marcy Gyms. You can perform 30 plus exercises with Bowflex, which is not possible with the Marcy. With its 300 lbs weight category and power rod resistance, it is a popular choice amongst the users. The Bowflex PR1000 is significantly lighter in weight than the rest. Moreover, it is affordable than other higher priced commercial-level home gyms. We prefer Bowflex over Marcy due to its patented power rods that work through cables and pulleys. There is no need to pick up weights, you can move as power rods to change the level of resistance. This feature gives every muscle a thorough and rigorous workout. 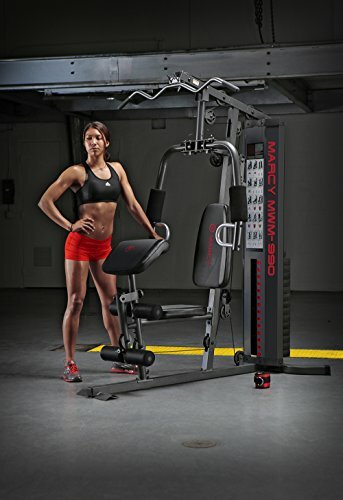 Bowflex provides users with a range of motion, unlike the Marcy where cables and pulleys are connected to the weight stack. This makes Marcy less convenient for other exercises not requiring cables or pulleys. Furthermore, Marcy only offers 150 lbs of resistance and Bowflex offers 210 lbs. Marcy provides a warranty on its frames only, with Bowflex providing warranty on frame, parts, and power rods. There is no going wrong with the selection of Bowflex as one of the best home gyms for a full body workout. It is durable and offers quality workout for the whole body at a reasonable price range.